This is the story of Sudan who I was lucky enough to come face-to-face with in May 2016 at the Ol Pejeta Conservancy in Laikipia, Kenya. I travelled to Kenya to specifically visit a number of rhino conservation projects which Real Africa is proud to support through our #RealRhinos fundraising and awareness campaign for conservation charity Save the Rhino International (registered charity number 1035072.). Ol Pejeta Conservancy is the largest black rhino sanctuary in East Africa and a haven for the last remaining Northern White Rhinos in the world. It seemed fitting on World Rhino Day (22 September 2016) to share my experience of meeting both Sudan and baby orphan rhino, Ringo via this blog. Sudan is a formidable figure. At around 3 tonnes he looms large on the landscape. He is the last surviving male Northern White Rhino . Northern whites are known to be the most sociable of the five rhino species, and it was easy to see he had a special bond with his rangers who affectionately tickled him behind the ear and on his mud-caked belly. Also in this special 700 acre enclosure, patrolled by 24 hour armed guard and only accessible by 4WD are two female Northen White Rhino, Fatu and Najin, making up the last three of their species in the entire world. In an effort to protect Sudan and his family, his horn has been filed down to make him less of a target to poachers. Sudan was born in Shambe, Southern Sudan in the same year as me – 1973 – but was captured at the age of one and spent much of his life in captivity in a zoo in the Czech Republic. When he was born there were around 700 Northern Whites in the world, their numbers having plummeted from an estimated 2000 wild Northern Whites in the 1960s. By the early eighties, the picture was bleak for Sudan and his kind with just 350 Northern White Rhinos remaining, decimated by poaching. By 1984, as famine crippled Ethiopia, there were, shockingly, just 15 Northern Whites left. 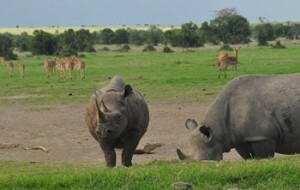 Sudan stayed in captivity until moving to Ol Pejeta in 2009. At this time the numbers had dwindled further with only 7 Northern Whites surviving, all now in captivity. Sudan moved to Kenya with another younger male Suni, his daughter Najin and grand-daughter Fatu as part of the ‘Last Chance to Survive’ project. Breeding was unsuccessful at Ol Pejeta and despite there being hopes in 2012 of Suni and Najin mating, it came to nothing. In 2014 Suni sadly passed away – a bitter blow. Sudan did have a son while in captivity in the Czech Republic, Nabire, who stayed in captivity at the zoo but tragically died in 2015. There was one other male Northern White at this time, Angalifu, who was in captivity with a female, Nola, in San Diego Zoo. Angalifu was older than Sudan however and past breeding age – he died in 2014, followed by Nola in 2015. 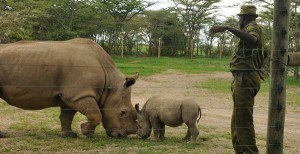 Sudan, now 44, is old in rhino terms. His back legs are weak and buckled and his sperm count is low so there is very little hope that he will sire naturally. With just 3 Northern Whites left, all from the same family, attempts are now being made to cross-breed with the closely related southern white rhino. 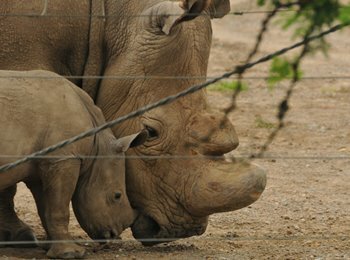 The rangers told us that in vitro fertilisation techniques and stem cell technology are also being explored, although these costly and complicated procedures have never before been attempted in rhinos. One other idea is to use a southern white as a surrogate mother for a northern white embryo. 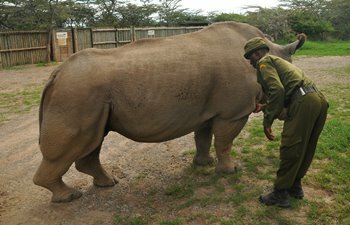 Ol Pejeta has joined forces with Tinder to try and raise money to save Sudan’s species and invest in a breeding project. Find out about the World’s Most Eligible Bachelor and the mission to save the Northern White Rhino here. Everyone says that baby rhinos are cute – and they’re right – but meeting a 3 tonne, 44 year old rhino is an even more impactful. Since my return I feel an even greater commitment to supporting conservation efforts in the hope that my own children and their children will be able to one day see rhinos as mighty as Sudan roaming the great African wilderness. Visitors to Ol Pejeta can book a 45 minute visit to the Northern White Enclosure for $40 US per person – this takes you on a behind the scenes journey, meeting the Northern Whites and their rangers. We can book this on your behalf, or you can do it directly on the Ol Pejeta website – proceeds from your visit go back into rhino conservation on the conservancy. Visits to the enclosure are in 4×4 vehicles only – if you are in a micro-van, it is possible to switch to a conservancy 4×4 at the Education Centre. 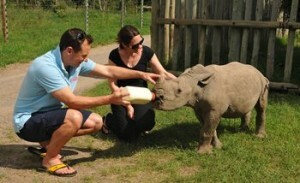 Ringo was abandoned by his mother, a southern white rhino at just 2 weeks old. I had been following his progress closely from the UK and so it was fantastic to get the chance to meet him and speak to his rangers. The rangers provide Ringo with 24 hour care. He was 5 months old and full of energy when I was fortunate enough to spend some time with him in May 2016. In July 2016 I heard that Ringo’s health had deteriorated – specialists from South Africa were consulted and every effort was made but sadly he passed away on the night of 19th July surrounded by his devoted rangers. As the conservancy said, “During his short life, Ringo inspired hundreds of people all over the world with his playful antics and irresistible charm. In simply being himself, he helped to raise awareness about the plight of rhinos in Africa.” When I heard the news I immediately questioned whether close contact with humans was advisable and had possibly contributed to Ringo’s demise. 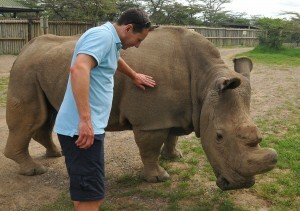 As much as it was lovely to be close and to feed him – this was a rhino destined for a wild life again one day. Raising these animal orphans is undoubtedly an incredibly complex issue. We hope that through our #RealRhinos campaign with Save the Rhino International we can raise awareness about rhino conservation and raise vital funds for important field programmes – we welcome your support in communicating this message. You can find out more here. When I arrived with my husband to meet with ranger Peter at 245pm sharp for my visit with young Ringo, I thought I must be horribly late. Ringo was charging around impatiently, kicking up dust, eager for his giant bottles of milk. He nudged our legs forcefully and lent heavily on the legs of the rangers before making a brief detour to a wheelbarrow propped in the corner for a scratch. On seeing the two giant bottles he was back in a flash – guzzled his milk enthusiastically, before positioning himself perfectly, seeking a good old tickle on his perfectly round little belly. Ringo was adorable. Full of charm and incredibly expressive. After he had his milk, his ranger led him through the gate to a stable like set-up for him to sleep at which point on the other side of the fence, a far larger rhino cast a huge slice of shade over sleepy little Ringo. Ringo immediately seemed re-energised and backed out of the stables to go and greet Sudan. Sudan was very tender with Ringo. They bumped noses and seemed to complete a playful little dance moving gently back and forth across the yard. Sudan then came right up to the open gate and just like a friendly labrador seemed to ask for attention – I gave him a scratch behind the ear, which he seemed to like, backing up a little , getting closer still. Encouraged by the rangers and heeding the warning to watch my toes, I then gave him a belly scratch, a cloud of dust like icing sugar floating into the air. It was a special 10 minutes. Fact: there are just 29,000 rhino in the world today. 20,000 Southern White Rhino: of the five species the southern white is the most populous, although it is important to remember that this species was decimated in the early 1900s with only 50 in existence. It is a tribute to conservationists that the population has managed to bounce back to around 20,000 in Africa today. 5,000 Black Rhino: Black rhino suffered a 96% decline from 65,000 in 1970 to 2,300 in 1993. Their numbers have risen steadily with the help of conservancies like Ol Pejeta, Lewa and Borana and the efforts of wildlife conservation organisations like Save the Rhino. 100 Sumatran Rhino – there are less than 100 individuals. A captive breeding programme hopes to boost the population. 60 Javan Rhino – a single population exists in Ujung Kulon National Park – they desperately need more habitat. 3,500 Greater One Horned Rhino – also known as the Indian Rhino, this species has recovered from just 200 or so in the 1900s thanks to the efforts of the Indian and Nepalese wildlife authorities. Approximate figures – with thanks to Save the Rhino International. Ol Pejeta was purchased in 2004 by Flora and Fauna International, with financial support from a private philanthropic organisation, Arcus Foundation. 90,000 acres of savannah grassland was converted from cattle ranch to national land trust. As well as being a sanctuary for rhino, Ol Pejeta has one of the highest densities of predators in Kenya and a chimp sanctuary, opened by Jane Goodall, to rehabilitate rescued animals. The conservancy is very beautiful. Our game drives were undoubtedly enhanced by the May rain which made the elephants of Ol Pejeta incredibly playful as they trumpeted at each other and chased the poor crowned cranes from one puddle to another. May is also a great time for seeing baby animals – there were new-born elephants, impala, zebra and giraffe all in abundance. 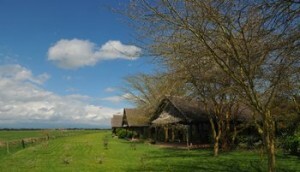 There are several places to stay – Sweetwaters Tented Camp, Kicheche Laikipia and Porini Rhino Camp among the choices. After an international flight you have two choices to reach Ol Pejeta and the Laikipia Plateau – you can be driven or you can fly. Check-in is usually at lunchtime so I stopped to freshen up and have some breakfast at one of the many airport hotels around Nairobi, before making the drive which depending on traffic takes anywhere between four and five hours. Alternatively you can fly. 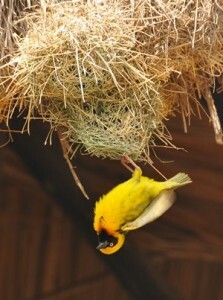 You can imagine the delight as we pulled up at the gates to Ol Pejeta to complete conservancy formalities while the bright yellow weaver birds busied themselves overhead. Just a short ten or fifteen minute drive via dozens of zebra and impala we reached Sweetwaters. Caroline, from reception was there to greet us with a broad smile, cold towel and a fresh juice. We were then invited to join lunch – a delicious curry buffet accompanied by an ice cold Tusker beer overlooking the camp waterhole. A pair of rhino sauntered over to the waterhole, flanked by impala – a fine welcoming committee. 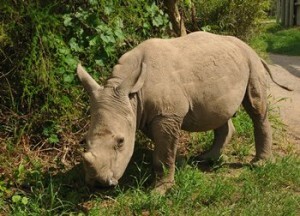 Following lunch, we settled into our tent and were delighted to see more rhino, just yards from the deck. The Morani tents fan out to the right from the main lodge building – all have wonderful views across the plains and down to the waterhole. The tents are incredibly spacious, and very comfortable with huge wooden bed, dressing table and a comfy armchair. Although the main structure is canvas, there are glass French doors, a wooden deck and a modern ensuite bathroom with walk-in shower, flush loo, double basin and tiled file. 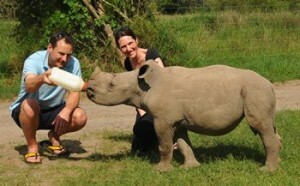 On behalf of every client travelling we donate £50 per person to Save the Rhino International. To find out more about the work of the Real Africa Trust please click here. We are holding a special fund-raising evening at London’s Royal Geographical Society on 12th October 2017 called Explorers against Extinction. This will also incorporate a major art exhibition called Sketch for Survival. To find out more please visit the event website here.